Kantner is currently being held for a ransom of 30 million pesos (approximately 600 thousand U.S. dollars). 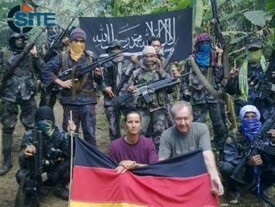 Since his recapture, he has appeared in three videos, in which he pled with the German government to meet ASG’s demand and communicate with the Philippine government to negotiate his release. In his most recent video, Kantner also said goodbye to his family. Since the start of 2014, ASG has become increasingly notorious for using kidnapping-for-ransom as a way to fund itself, as it appears to have modified its original ideological goals to more financially oriented ones. At any given time, it reportedly maintains over 10 hostages, demanding payments through notes, messages, and videos. However, as the group has shown ties to the Islamic State (IS), it is important to note the motives of ASG’s separate factions. The faction discussed here seldom refers to IS and seemingly acts independently from its counterparts, especially in its media distribution. Its focus remains almost entirely on extortion and hostage taking, and its demands are almost always financial. In regards to hostages, the majority of its victims are Filipino. However, the group frequently captures foreign nationals, including Australians, British, Canadians, Chinese, French, and Germans. Hostages are rarely – if ever – released by ASG without receipt of the ransom. 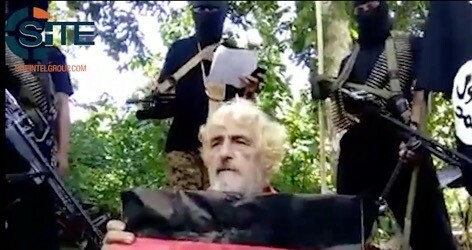 In the case of Kantner, his third video was provided as a “final ultimatum,” and, on February 16, 2017, the Philippines’ Armed Forces announced a rescue mission to recover him as well as ASG’s 26 other foreign and local hostages. Kantner’s execution is set for February 26, 2016 at 3 P.M.
2014: During 2014, ASG demanded ransoms for their captives without the use of video. In the case of two captives, Stefan Okonek and Henrike Dielen, the group released three photos. The majority of cases below took place off the coast of Sabah, Malaysia, with some near the shore of Palawan, Philippines. ASG held its victims in Sulu, Philippines. A message attributed to ASG was disseminated in September 2014 claiming the capture of two German nationals, Stefan Okonek and Heinrike Dielen, in April of the same year. The messages demanded a payment of 250,000 pesos in addition to requiring the German governments to halt supporting U.S.-led coalition airstrikes on the Islamic State (IS) in Iraq and Syria. Along with the message, ASG released three photos of the hostages, two showing Okonek and Dielen kneeling in front of ASG fighters, and one of Okonek alone talking on a phone. Okonek and Dielen were freed on October 18, 2014. ASG claimed receiving the total ransom payment, though from whom is unknown. On April 2, 2014, armed gunmen abducted Chinese national Gao Huayun and Filipino resort worker Marcy Dayawan from the Singamata Adventures Reef and Resort in Semporna, Sabah, Malaysia. Approximately a week later, the Malaysian Minister of Home Affairs at the time, Datuk Seri Zahid Hamidi, reported receiving a note setting Gao’s ransom at 500 million pesos. ASG later released both Gao and Dayawan on May 31, which Mayalsian Prime Minister Najib Razak stated was due to the cooperation between the security forces of Malaysia and Philippines. A second Chinese national, Yang Zailin, was abducted by masked gunmen from the fish farm where he worked on the east coast of Sabah on May 6, 2014. Despite the Sabah police commissioner’s claim that no ransom was provided for Yang’s release, some media agencies reported the undisclosed ransom was paid. He was recovered on July 10. Several media reports detail a second kidnapping from a fish farm in Kampung Sapang on June 16, stating that the hostage, Chan Sai Chuin, remained in the custody of ASG at the time of Zailin’s release. However, on Dec. 10, Chuin was freed by ASG following negotiations between Filipino emissaries and ASG. His ransom demand was 3 million Malaysian Ringgits (approx. 675 thousand U.S. dollars). ASG fighters kidnapped Malaysian police constable Zakia Aliep at the Mabul Water Bungalow Resort in Sabah on July 12, 2014. Aliep was held for a much longer period of time than the aforementioned cases, for a total of eight months, with his release on May 7, 2015. On July 27, 2014, ASG attempted to abduct Malaysian National Ab Rajah Jamuan in Sabah; however he was killed during the attempt. 2015: ASG continued its kidnapping operations off the coast of Sabah, Malaysia. The group additionally released a series of videos showing four foreign nationals captured in Samal, Philippines, two of whom were later beheaded after demands were not met. A fifth foreign national of South Korean descent was abducted in Zamboanga Sibugay. He was found dead 11 months later. South Korean Noi Sung Hong was abducted in Zamboanga Sibugay in January 2015. ASG released a photo of Hong, demanding a ransom of 500 million pesos, but supplied no video. The group never received the ransom payment, and Hong was discovered dead in a sack in November that same year. It was determined that Hong potentially died from illness as no trauma was found on his body. On Sep. 21, 2015, ASG kidnapped two Canadian nationals, one Norwegian, and one Filipino, Robert Hall, John Ridsdel, Kjartan Sekkingstad, and Marites Flor, respectfully, from Samal, Philippines. The group released a series of videos of the hostages, demanding the sum of 1 billion pesos for each of them, though it later lowered the ransom for Hall and Sekkingstad. The group extensively increased its threats of torture and murder throughout the video series, including execution, beheading, and infliction of pain. In response, Canadian Prime Minister Justin Trudeau acknowledged Ridsdel’s family taking part in negotiations with the group, but indicated his government will not pay the ransom. Despite militarily assessing the capability of a rescue operation, both Canadian hostages were executed. The beheading of John Ridsdel was shown in a video released May 3, 2016, while he was killed in April. Robert Hall was beheaded in a video released June 14, 2016, one day after reports of his beheading following the expiration of the deadline. However, after reportedly receiving 32 million pesos (638,000 dollars), ASG released Norwegian Kjartan Sekkingstad on September 17, 2016. Filipino Maries Flor was additionally released on June 24, 2016. On May 15, 2015, two Malaysians, Thien Nyuk Fun and Bernard Then, were abducted by ASG from the Sandakan Resort in Sabah. The ransom amount was set at 30 million pesos for the two of them, and, upon receipt of the ransom, Thien Nyuk Fun was freed on Nov. 9, 2015. However, after freeing Fun, ASG raised the amount of the ransom and eventually beheaded Then eight days later on Nov. 17, 2015. 2016: During the year 2016, ASG increasingly kidnapped sailors and fishermen, demanding ransoms from respective governments or companies. Operations continued to take place in Sabah as well as Sulu and Basilan. 2016 is additionally the year Jurgen Kantner was once again kidnapped, this time by ASG, and his partner, Sabine Merz, was killed. While no videos were released for the several kidnappings of sailors, the group disseminated three videos of Kantner, the third of which dedicated Feb. 26 as his date of execution. On March 26, 2016, ASG captured ten Indonesian sailors off the coast of Sulu from the Brahma 12 tugboat and Anand 12 barge carrying coal to the Philippines’ Tawi-Tawi province. The cmopany that owned the boats paid the ransom of 50 million pesos, and all ten sailors were released on May 2, 2016. ASG kidnapped four Malaysians aboard a tugboat as they arrived on the shore of Ligitan Island in Sabah on April 1, 2016. The four were released two months later on June 8, though the Philippine Army did not confirm if the ransom was paid. On April 15, four passengers were kidnapped from Indonesian tugboats after being attacked by ASG fighters. They were released on May 11 with the help of the Philippine government. A South Korean skipper and Filipino crewman were kidnapped on Oct. 21, 2016, after 10 ASG gunmen boarded their ship bound for South Korea off the shore of Bongao, Tawi-Tawi, Philippines. Their status is currently unknown. A Vietnamese cargo ship was attacked by ASG fighters on Nov. 11, 2016. Six sailors, including the captain, were abducted from the ship. the Vietnamese Embassy is currently working with the Philippine government to recover them. ASG is structured almost as an octopod, with its tentacles extending into the various Philippine provinces, but seemingly acting independent of each other. Despite having initial support from al-Qaeda (AQ) in the late 1980s and early 1990s, the group in its current incarnation is divided between those who pledged allegiance to the Islamic State (IS) and its leader, Abu Bakr al-Baghdadi, and one that retained the “Abu Sayyaf” brand and appear autonomous. Isnilon Totoni Hapilon (AKA Abu Abdullah al-Filipini), the former ASG central leader and operated out of Basilan, has since pledged to IS and serves as the group’s official for all affiliated fighters in the Philippines. Other factions within ASG have also pledged to the IS, including the Jund al-Tawhid Battalion and Ma’arakat al-Ansar Battalion in Sulu, and the Ansar al-Shariah Battalion. As part of the IS, all that a constituent group produces, including statements and multimedia, is directed through the IS media machine. Just as they cede autonomy in decision-making and operations, they also give up media independence. Important to note is that ASG additionally has ties to Jemaah Islamiyah (JI), a jihadist group in Southeast Asia, the leader of which, Abu Bakar Bashir, pledged loyalty to IS in July 2014. JI supplies funding to ASG in exchange for harboring JI militants. Here, only the ASG division conducting the kidnappings continues to use the group name and release its own media, indicating that it operates independently. Also, converse to established IS practices in its public releases to demand prisoner swaps and cessation of airstrikes in return for hostages, the ASG division in Sulu that captured the Canadians, Norwegian, and German asked for financial ransoms. However, in the case German hostages Stefan Okonek and Henrike Dielen in 2014, ASG additionally made demands of the German government to halt participation in the U.S. coalition on IS in Iraq and Syria. On May 19, 2015, a self-professed affiliate of ASG calling itself “Ma’rakat al-Ansar,” pledged to IS in a video. Fighters in the Philippines, including leaders and representatives from three factions, pledged allegiance to IS chief Abu Bakr al-Baghdadi in a video released Jan. 4, 2016. Notably, featured in the video is Isnilon Hapilon (AKA Abdullah al-Filipini), the leader of the Basilan-branch of ASG, who leads the fighters in the pledge. On March 21, 2016, a video from Jund al-Tawhid Battalion, a group belonging to ASG in the Sulu region of the Philippines, showed members pledging to Baghdadi. IS’ Amaq News Agency also reported on the pledge. IS' ‘Amaq News Agency published an infographic on June 10, 2016, on pledges of allegiance to IS from militant brigades in the Philippines as well as the death toll among Filipino soldiers between April 2015 and April 2016. According to the infographic, ten militant brigades have pledged to the IS in six provinces of the Philippines, with the first "official" pledge having come in January 2016. The objective of ASG is establishing an independent Islamic State in the southern Philippines, and as it pertains to the branch responsible for kidnappings in Sulu and elsewhere, focuses the majority of its operations on kidnappings-for-ransom in order to finance its jihad. While ASG is estimated to have between 200 and 400 members, operating primarily in the provinces of Sulu Archipelago and Tawi-Tawi, Philippines, it is important to remember its relationship with the Islamic State (IS) and division among its factions. Here, the fighters who conduct the majority of kidnappings appear to be independent of IS and more so financially driven. As the group has taken on this financially-driven motive, the fate of Jurgen Kantner likely heavily relies upon the receipt of his 30 million peso ransom. In only one case, the May 15, 2015, kidnapping of Bernard Then discussed above, ASG beheaded its captive following the receipt of his ransom. In this instance, however, the group decided to raise the ransom despite receiving the previously-agreed upon sum, and in turn beheaded Then. It is widely believed that no captives are ever released without ransom, and rescue missions have unfortunately often failed in the past. Additionally, another widespread belief is that separate militant groups operating in the Philippines regularly sell captives to ASG, as the name recognition allows for a greater sum. ASG has grown dramatically within the past few years, likely due to its funds acquired through kidnapping, and it remains one of the most violent terrorist groups in the Philippines. Its notorious ransom and beheading videos most often feature foreign nationals, in which demands are made upon the victims’ respective governments. In 2013, Germany, the home country of Kantner, along with most other major Western countries, signed a commitment not to pay ransom to terrorist groups. Consequently, the fate of Kantner is still unknown.